This past Thanksgiving I volunteered to bring our family's traditional Polish kielbasa and cabbage dish to the holiday dinner. 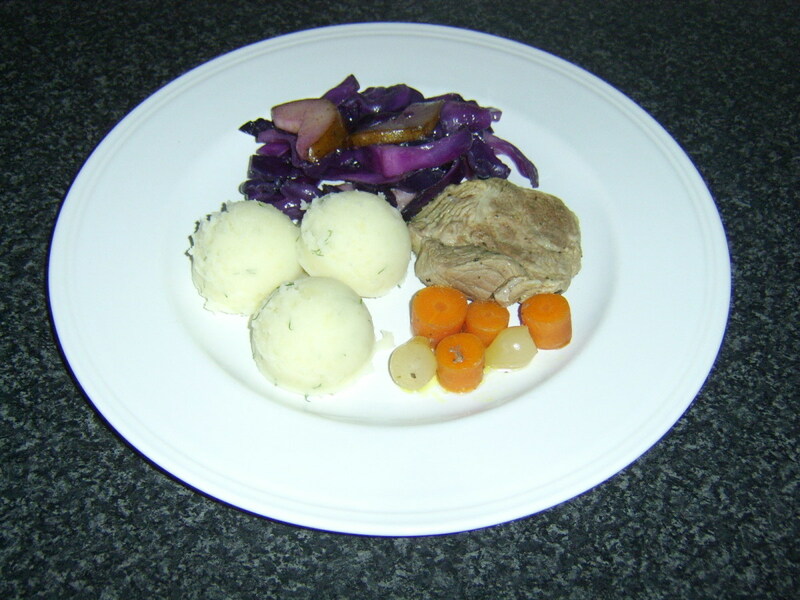 Ours is a simple recipe consisting of traditional Eastern European ingredients including onion, garlic, cabbage, sausage, black pepper, and apple. Our version of this dish is mild-tasting and slightly sweet, and we all love the recipe just as it is. But this year I decided to charge up the flavor a bit by adding sauerkraut to the cabbage, something I had never done before. It took a few minutes for me to realize that the garish blue-green material was pressed garlic that had gone through a color transformation. Suddenly, a long-forgotten memory began to surface about making copper sulfate crystals in my high school chemistry class. 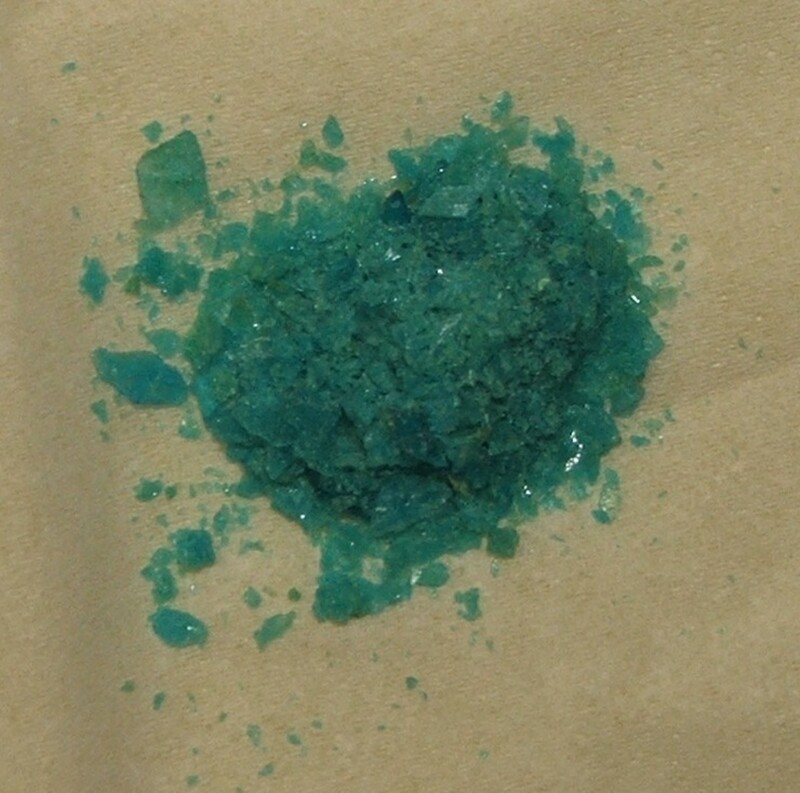 The color sprinkled around the cabbage and kraut in the pot looked somewhat like the color of those crystals, only a bit more green, in fact, much the color of the corrosion that can appear at the junction of a car battery and its terminal. 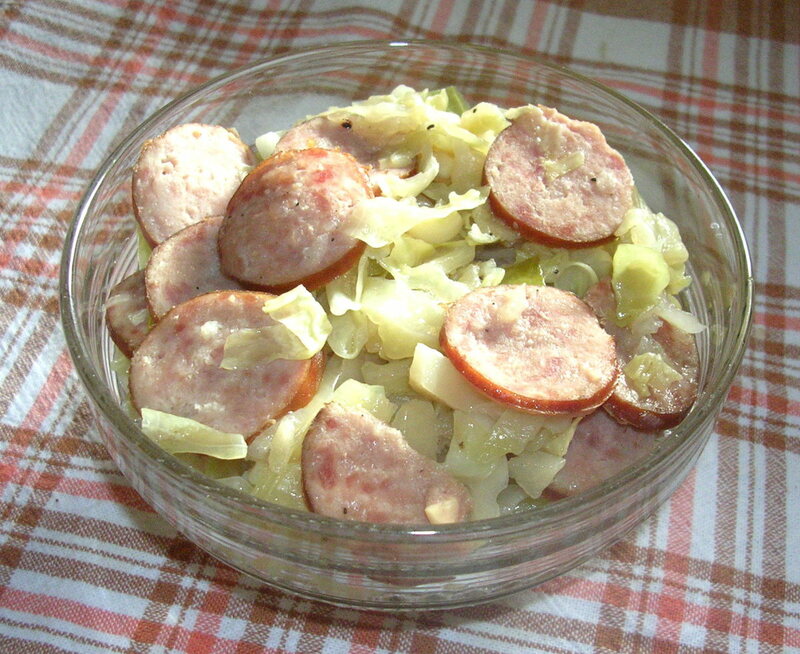 Never in my cooking life had garlic turned blue-green, but never had I cooked my family’s original kielbasa and cabbage dish with sauerkraut, either. I suspected the color change had something to do with the acid in the kraut and whatever chemicals are in the garlic. Garlic Turning Blue Is Sometimes Called "Greening"
This term is a misnomer because multipyrrole production in garlic, the process that turns garlic shades of blue and green, has nothing to do with restoring freshness, aligning with principles of the Green Movement, or exposing garlic to light. If you would like more in depth information on the chemistry behind garlic turning blue, read the excellent article written by The New York Times columnist Harold McGee, When Science Sniffs around the Kitchen. Scroll down to about the last third of the page. How Does Garlic Turn Blue? Studies prompted by the food industry as a result of increasingly occurring batches of accidentally colored garlic have begun to unlock the mystery of why garlic turns blue.These studies have found a number of complicated chemical processes responsible for garlic turning shades of blue, green, and even pink under certain conditions. The colors occur when enzymes and amino acids present in garlic react with the sulfur compounds responsible for garlic’s pungent smell. The reaction causes different multipyrrole molecules to form. Different types of multipyrrole molecules are responsible for the different pigments. The multipyrrole molecule most familiar to us is chlorophyll, produced by plants in the presence of light; however, chlorophyll is not produced by the cooking or pickling processes that turn garlic blue. If your answer is yes, please share your experience in the comments section. Have you been surprised by garlic turning blue? Age of the garlic - Some sources say that newly harvested, unaged garlic (meaning garlic with a high water content), is more prone to turning color; other sources say the opposite. Added presence of acid - It seems clear that the presence of acids such as lemon juice or vinegar can cause a color change, although not always. Temperature - Garlic that is pre-heated may or may not react with acid to change color. Color of garlic bulbs - Some garlic is pure white, some has tinges of purple or red; the colored garlic may be more prone to turning blue-green. There is at least one place in the world where garlic is deliberately turned into a jade-green color. For centuries the Chinese have produced Laba garlic, a jade-green pickled garlic which is an important food accompaniment to celebrating the harvest festival of Laba. If the Chinese can perfect this color change in garlic, why do we have only “accidents”? If your garlic turned blue by surprise, you may have already researched this accident and found discussions about sulfur compounds in garlic reacting with copper present in water supplies, utensils, or copper-rich foods. There may be validity to this explanation, in which case the blue color indicates the presence of copper sulfate, not the presence of multipyrrole pigments. Absent any sign of spoilage such as foul smell or mold, your blue garlic is safe to eat. I was making a cholesterol tonic of equal parts of ginger juice, lemon juice, apple cider vinagar and garlic juice heated and stirred for 30 min. It first turned pink, and then blue and then Dark blue green. Looking on the web I found your posts. Thank you for explaining what had happened to the garlic. Needles to say I could not sell this chutney but I decided to complete the recipe for home consumption. I added brown sugar and continued to simmer for about 11/2 hours. When it was finished not a trace of blue garlic - has another chemical reaction taken place? However I shall not be selling this chutney just in case there is some blue I've missed! A year's supply of chutney. I have just read your article regarding the blue Color Change in garlic and would be very interested in the literature references you mentioned throughout the article. If it is possible for you I'd be very thankful for a list of your science papers / Journals you cited. I have just come across the garlic Color Change phenomena myself and am deeply interested in finding out more about the process. I've boiled a few garlic cloves with the juice of lemons and the peels, ground ginger, cinnamon sticks, green teabags and diced cucumber in water in my attempt to shed a few pounds. While leaving it to cool down before straining i've noticed that there was turqoise pieces floating in this concoction, then i was wondering whether it's safe to drink. That's when i came to the conclusion that it must be the garlic turning colours when mixed with something acidic for instance the lemons in this case. But i thank you for sharing this info 'cause now i feel safer to consume this drink knowing that it' s normal for garlic to change it's "stripes". I had the experience of my diced garlic, with lemon and vinegar, turning beautifully blue. It concerned me a little but I used it without ill effects. Thanks for putting my mind at ease. After successfully pickling & using all our organic home grown garlic last year, I decided to try it again with a few cheap bunches marked as Product of China from the supermarket last week.....cue several bottles of brilliant cyan-aquamariney cloves in a smurf sea! Maybe it was age, maybe some spray applied for storage & shipping.....maybe they were 'born with it'! Maybelline jokes aside, we've decided to ditch the lot & start again, just as a precaution. But it made for an interesting fridge find! Thank you so much. I had placed hot peppers and a few pieces of garlic in vinegar and noticed that the garlic turned bluish green. I was alarmed and tossed the garlic which looked toxic. Your information was most helpfu. I routinely get 4 strips of beautifully fresh garlic at Acme. Very white and firm, tight, no sprouts. The only ones that turned blue/green/grey of the 20 were the 3 I baked in aluminum foil on an aluminum pie tin. I cut the tops off like all the chefs say. There was a roast turkey in a separate roasting pan in the oven too. The garlic didn't soften in the 45minutes they say but they did turn grey/green/blue icky colors. I had to cook them an hour longer and they still weren't the proper gooey-soft. Besides the ugly color, they tasted terrible. 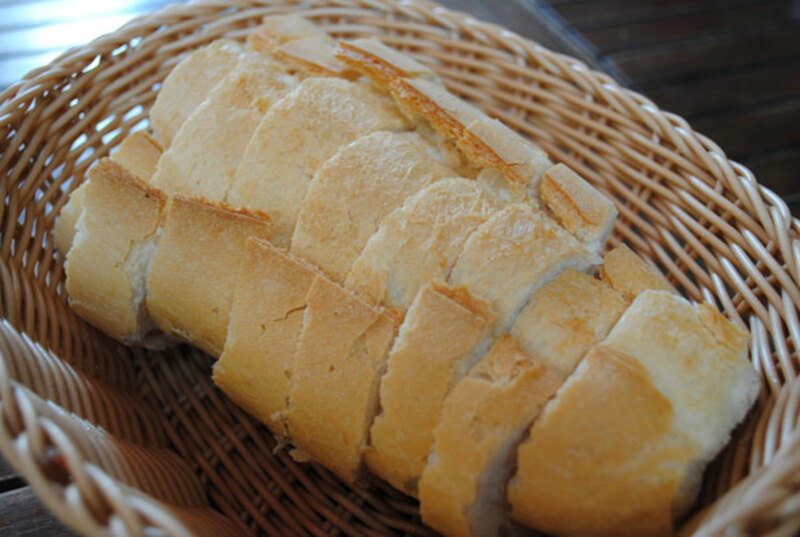 They never became roasted-sweet and were inedible. 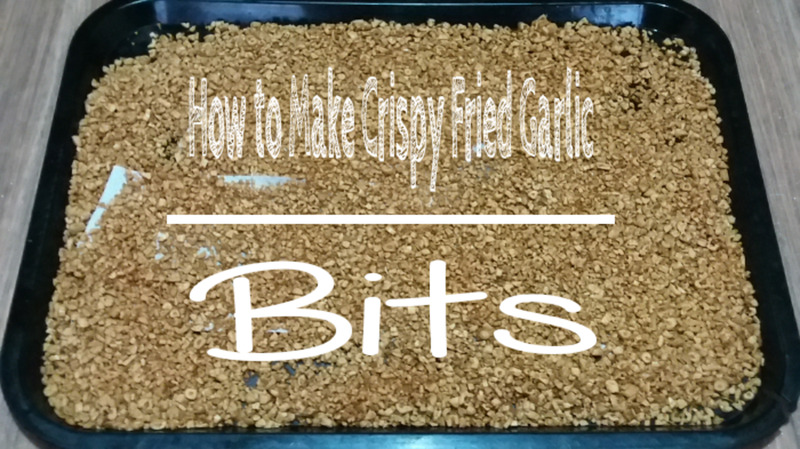 They were not the golden-brown, soft-gooey, buttery garlic I had wanted to freeze & have on hand. All the top chefs make it seem so easy to just throw in the oven - never comes out bad. I don't use copper. Also in a separate pan was either a pre-brined turkey with stuffing or pre-brined chicken. Was it the moisture in the oven? Or because the garlic was so fresh? Why wouldn't any of the rest of the garlic turn in any other recipe? What made it turn? An ingredient in the brine or stuffing? Is there a list of metals & acidic ingredients' that do that? Copper, Aluminum, Onion, lemon, vinegar? Garlic is frequently with acids so that can't be it... A lot of times the chefs put the garlic in the oven alone - is this why? It seems a waste of energy to us. But is this for a reason? I just want to know how to prevent this. Does the garlic industry know about this? Does anybody know why baking it would turn it while stove-top or raw wouldn't? Thank you. I make this awesome germ killing concoction with chopped/crushed garlic in a jar with soft honey poured on top in keeps for months on end in the fridge. Yesterday I made a batch of 3 pints. This morning all 3 jars are are very Brite Green. Scared the hell out of me. I've been working with garlic my whole of 50 years. 1st time ever. I just made a big pot of Slavonian sauerkraut and when I checked it after a few minutes, I was shocked to see pieces of moldy looking garlic. I thought it must have been color that came out of a bell pepper but this hasn't happened in 50 yrs of making the same recipe. I tossed the whole mess out and started all over again without the bell pepper this time. The same thing happened again. I'm seeing this does really happen! Now I'm not liking that my garlic is sprayed with stuff....would this happen if I used ORGANIC garlic??? Making Curtis, Salvadorian pickled cabbage with garlic. Minutes later the garlic turned blue greeen. I encountered this phenomenon yesterday for the first time (in my 70+ years of life on this earth) when I made my third jar of refrigerator-marinated mushrooms using white buttons, white vinegar, virgin olive oil, Italian spices, pickling salt, hot pepper flakes, and crushed garlic cloves. Before adding any raw garlic to the mix, I peeled four cloves and sliced off their rough "root" ends. All looked perfectly normal but I thought the cut ends smelled a bit "off." Unlike the fresh, pungent garlic odor I'm used to, these cloves were definitely "musty." Since it was the only head of garlic I had, I put the four cloves in the jar assuming my odor receptors were compromised by having just pre-boiled the mushrooms in stinky vinegar. Though it seems it's safe to eat, I'm not real keen on putting the discolored garlic into my mouth or even leaving it in the jar--so I've picked it out and am thinking I'll replace it with a different kind to see if that makes any difference. The head that turned blue with pickling was a stiff-necked variety from one of Walmart's "loose" bins. 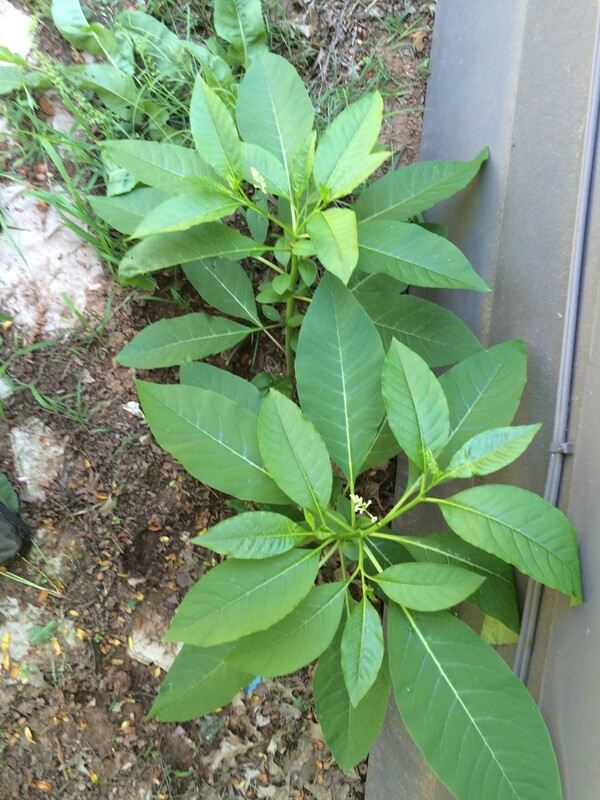 It had no striping or other coloring and contained no shriveled/sprouted/browned or decaying cloves. Garlic cloves were got peeled and were found to be sprouting and preserved by adding apple vinegar. After gap of 5 days, it has been noticed that the color has turned blue..... never imagined that food turned blue remain edible .......interesting! I made a garlic and ginger paste, but forgot to store in the fridge. The next day I noticed it turned to a bluish hue. I googled and found it is ok and safe to cook. It turns green even in fridge. Just happened to me! I was making tea with fresh garlic, fresh ginger and lemons. I went to the store to get honey for my tea and when I returned, looked in the pot I saw the glue garlic. Decided I would Google before tossing it...glad I did! I've been cooking with garlic for many years, and I experienced this for the first time tonight. I was making a Blue Apron recipe that included a garlic cheese bread. I drizzled extra virgin olive oil on the cut sides of a small baguette, spread some grated garlic over that, then topped it with shredded lamb chopper cheese (which I had never heard of or used before). I put it in the oven to toast, but it was set to bake, not broil, so it never got really browned on top. It looked normal when I took it out of the oven, but a few minutes later it had developed bright green spots. I thought that must have been some really weird cheese...until I researched it. This just happened to me. I'm making fire cider and went to shake my jars this morning. Looked in the bottom and saw blue garlic cloves! First time I've ever seen this. Been cooking with garlic all my life. Glad it is not spoiled. Hate to throw away $40+ worth of ingredients. Happened to me when I had the idea to put garlic in cider vinegar. I knew it wasn't spoiled since the acid in vinegar prevent any bacteria to grow. This happened to me for the first time when making garlic dill pickles. I thought now this batch will have to be thrown out. Read this story on line and glad to know the batch is not spoiled. Thanks so much. Just cooked a pickled pork with vinegar, water, peppercorns etc and the garlic turned aqua. So googled and find your site. Thank you so much from Australia. Have cooked with garlic my whole life. Two nights ago making a lemon garlic sauce for an asparagus pasta dish and when I added the lemon the garlic turned a tourqois color. I was horrified. Picked out as much as I could and prayed no one would become ill. All the time thinking something was wrong with the garlic. That was a first for me. Glad to find out it is not harmful. This happened to me last night! I was sautéing some asparagus real quick-- I used my Copper Chef pot, added EVOO, a bunch of asparagus, salt, pepper, a few cloves of pressed garlic, and I squeezed half a lemon over the top... just a few minutes later I started to notice the blue and started picking it out. I thought a scrap of paper or something got in and the blue ink tinged it, or a thread off my shirt, or something! I thought something foreign got in but didn't know what! I ate a few stalks but I rinsed them off because I was weirded out. I'm glad I Googled blue garlic!! From this article a few things could have caused it... 1) new garlic, 2) lemon juice 3) copper pot... very interesting!! Boy, today this happened to me!, that is why I am on this page. I was cooking some lentils and, suddenly, after one or two minutes of heat, the garlic is there, looking at me with a very fearsome blue color. I immediately called my mom for advise and she told me that this had happened to her a few months ago!. What are the odds for two events in such a short period of time? 10 years i've been cooking i've never had garlic turn blue on me until today. Wow, this happened to me this morning, and thank you so much for posting this! I ate my green eggs & onions & garlic with pleasure, knowing now that it was safe! Hope to recreate this, as aqua is one of my favorite colors! Have a wonderful day! The sun is out again in San Diego! I've never seen this happen before! My garlic's were all out of the ground for 5 months give or take a few weeks. The 3 types I canned all turned blue within a few days. The Georgia Crystal went first then the Chesnock Purple follow by the Georgia Fire. I was going to pitch them out but thanks to this article I will keep. Next time I will can sooner and see what happens. This happened to me last night while making shrimp scampi. Shouldn't be anything unusual there, just some butter, fresh garlic, lemon juice, and shrimp. Must have been lemon juice, but wait, I've made that dish many times in my life! So, why this one time? Must be some other reason like the freshness of either the garlic, lemon, or butter and how it all combined. Thank you for your article! Very informative news. I searched the internet and read one comment that it could be due to fertilizers and pesticides that have copper. The user was advise to use garlic to reduce High Blood Pressure but to the contrary, it was increasing. After lab test they found copper in garlic. this color could be due to oxidation. I think we need further investigations. We just pickled several large jars of garlic over the holiday using an apple cider vinegar/lemon juice recipe, and this color change occurred! We used two varieties of garlic, mixed in the same jars together, and they reacted differently. The fresher garlic (elephant garlic) from the grocery store became turquoise and the aged garlic (smaller, from the garden) did not change. What a relief! Thank you for the info! So glad to know it will turn out ok! My grandmother fried peppers in oil, put them in a canning jar, added a sliced clove or two of garlic and covered all with vinegar. Very often the garlic has turned blue - did it again this year when I fixed the peppers! This is the first time anyone in our family noticed. It happened to me because I had two heads of garlic but was going on holiday for two weeks so I minced all the garlic in my blender and froze the minced bits. I came back and put the container in the fridge and it started going blue! I had heard of this before, but i just salted them to preserve them. I think if you are aspiring to get blue garlic, just chop them then freeze and defrost in the fridge. I have proof to show that my garlic jiuce has turned into BLUISH Green. Yes, I have had bright green garlic color change happen. We recently moved to Costa Rica and my supply of dried garlic was running low so I spent quite awhile peeling and chopping up a ton of fresh garlic some of which was the tinted reddish purple which has a great flavor fresh. I popped 2 trays into the dehydrator, switched them every 45 minutes. When I went to rotate them the 3rd time an entire tray had turned bright green, the color of poison so I thought it had gone bad due to new condistion (high humidity, and the dehydration process) so I threw out all the green tinted. I didn't think to check the web and since there was long term storage involved could not risk a contaminated food. Might have to try this again and see if I can repeat the results. Interesting, first time I have heard of garlic going green, hope it never happens to me, but if it does I won't be throwing it out now I know. I was catering my parents 60th wedding anniversary celebration and was totally freaked when I saw my gorgeous cous cous salad with blue flecks, I was frantically busy and didn't think to send someone to look it up - no one else thought to do it either so it got chucked. Now cross about the waste but relieved, in future if it happens it will be a feature! I am so happy to have found this page. I puréed my garlic and my onions placed them over heat and came back to find the whole once white puréed mix had turned easter egg blue. It actually scared me. I had no idea that was possible. I sense from what you have said above it was the water from the puréed onions and the heat that did the trick. I have veggies every day for lunch: Celery strips, Bell Pepper slices, slice of sweet onion, Pepperoncini's, Olives and 3 gloves of Garlic. I usually buy a bag (6-8) garlic heads. I then peel them and slice the bigger ones and put them in a jar. I pour White vinegar over them until they are covered. They are White for about a week, then you notice they are changing colors until they become a nice Blue. I keep eating them and I'm still here. I so didn't know that it makes me want to find out for myself. Glad it is safe to eat. I told my flatmate that I used to chop a lot of garlic, then stored them in refrigerator, just for the convenience for cooking for the whole weeks. Then she decided to try it on, but preserve it as garlic-in-oil because we think oil might help the preservation better than chopped garlic alone. This morning, we almost throw everything away because it turned green. Thanks for the good article! Thanks for this web site and Google search engine! I was panic and intended throw away my bottle of garlic. It's safe to eat! I like your hub about garlic. I cook garlic with some of my food. I glad that I was eating a lot of garlic. I need blue in my body because I am allergic to red. I love garlic. It makes me feel good. Thank you for sharing your knowledge. You are fantastic. This happened to me soon after I moved out and started cooking for myself. I had loved experimenting with complicated and new recipes and had had good success. Then this happened and I was shaken! What had I done, am I poisoning me or anyone else? The garlic wasn't even a complicated step. I think we ate the dish, but I was nervous til I knew there was no food poisoning. On another note, I remember my mom altering her chicken soup recipe once and it tasted cheesy...we had no idea why since she couldn't remember what she did differently (no cheese). It was so unpleasant, it ended up in the trash. I may be weird, but I hope to someday accidentally reproduce that accident just to have the cooking chemistry answer! My garlic and shallots turned green last night as I made a lemon butter sauce. I was cooking them down with lemon juice and wine before adding butter. 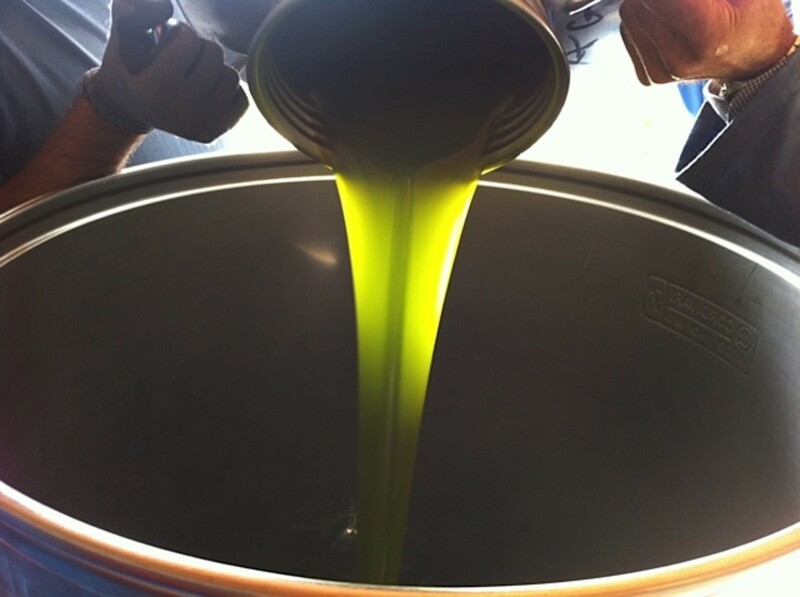 The introduction of the acid and heat turned them green-blue. Thankfully, after the sauce was mounted with butter, I could just strain them out. I had the same problem. I had some pickle juice left over from some gerkins and put in some garlic cloves to see what they would do. I'm colourblind and didn't realise that they'd turned blue until my partner started laughing about them as I was cutting them up! This is fascinating! 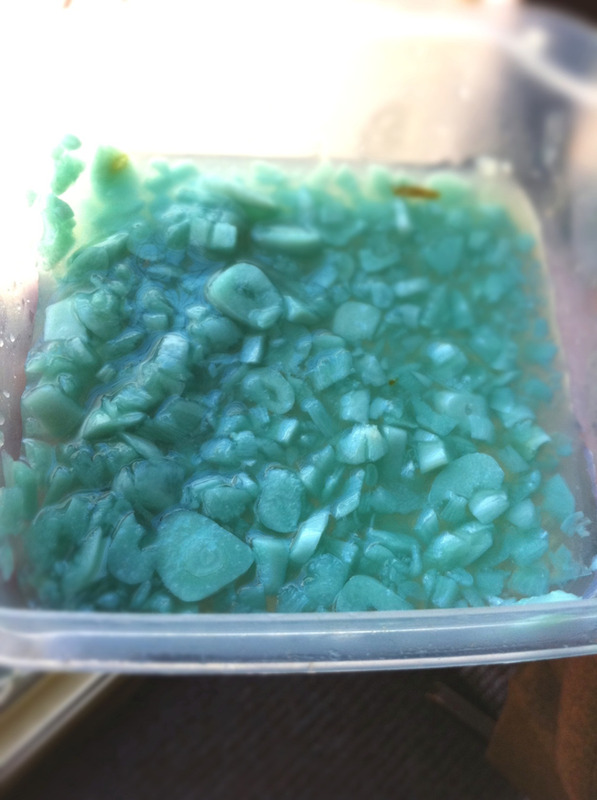 I have cooked with garlic for years and never knew it could turn turquoise. I would love to see it turn this beautiful color (especially since it's safe to eat that way). It could really enhance some foods and it too is my favorite color. Thank you for sharing this amazing information! And nice to meet you--I'm fairly new to Hub Pages. I cook with garlic all the time and have never had this happen. Maybe it's because I use it in mostly Italian dishes. Still tomatoes are acidic. I am fascinated by this and would love to make it happen. I made my "flu" shot remedy. Apple Cider Vinegar, honey, lemon juice, cayenne pepper, cinnamon and I normally press the garlic...traveling without my garlic press. I pressed a whole glove between two spoons and dropped it in...within 24 hours I thought I was seeing things... a beautiful turquoise clove of garlic... thanks to your article I will know I can safely continue my healthy remedy. First time blue garlic experience happened today. I put together a concoction to cook my beef in a crockpot. Combined vegetable stock, seeded mustard, tomato paste, worcestershire sauce and of course, chopped garlic. Let it sit there while I browned the meat. Poured the liquid over the beef and left it to cook. Low and behold, a little while later I checked it and noticed the garlic was blue. I chopped up about 6/8 heads of garlic, minced it with sea salt and olive oil and vinegar ( small amount of vinegar more as a preservative than for flavor) , next day opened the fridge to a pastel blue minced garlic, immediately went online searching and found several sites covering the subject, yup, it is safe to eat. I took the extra, added a little citric acid, heated it and put in small mason jars to seal for future use. Looks great in stir-fries, soups and multi veggy omelets!! It happened when I was cooking broccoli with garlic in the airfryer. First time this has happened to me. This happened to us when we first made Scotch Bonnet pickled garlic ... manged to make pink shallots too! I have eaten so much garlic in my lifetime, that I am surprised I don't look like a garlic clove. Like so many others commented, I have had garlic turn blue, too! I canned a lot of garlic about a year ago, and many of the bulbs have turned blue. It is actually a gorgeous color, and quite an improvement over their natural color, I might add. Great information here. I already knew it was safe, but your in-depth explanation is wonderful! My cousin and I just did our first canning experience, and canned 7 quarts of dill pickles. We used grandma's old vinegar/salt/water recipe and packed fresh dill weed and whole garlic cloves in each quart along with the cucumbers. Almost immediately after sealing, we noticed the 4-6 cloves in each jar were turning blue....almost neon. We were freaked out thinking something went wrong. Never heard of this! But found out it is okay and safe to eat. The pickles were awesome btw! I have never seen garlic turn blue! I'm glad you made this Hub so I know what it is. I cook with garlic daily, and I have never had this happen. Now, I almost want it to happen! Very interesting, will share on Pinterest. I wonder how many foodies have had this happen to them? I can't help but wonder if different types of garlic are more prone. I bought some garlic recently, but was subsequently warned away from it by a friend because it was imported from China. Even so, I cooked it (a recipe I'd made many times before, without any alteration but the Chinese garlic), and it turned turquoise. Is it possible that the people who manufacture the garlic in China use some pesticide or fertiliser that would cause this to happen? Or is it just a coincidence that the first time I made the dish with this garlic was also the first time it turned turquoise? I always put a whole garlic sliced in half with a halved lemon inside my chicken before I roast it. Garlic turns blue every time. I decided to make some Giardiniera, and added some garlic to it. Within 48 hours, the garlic started to turn a pretty shade of blue. I thought I had done something wrong in the pickling process and was ready to chuck a whole gallon. I decided to try to find the reason for this, and found this blog. Saved me a lot of money and peace of mind, knowing they garlic is safe to eat. Also learned why when I put garlic in the cavity of a roast chicken along with lemon same thing happens. And I get to impress family and friends with my knowledge of chemistry in explaining how and why the change in color occurs. Eek! this just happened to me while making pulled pork in a ceramic slow cooker. A lot of the possible causes/combinations mentioned by others were involved: vinegar, pork, ginger, low temperature cooking, onions, etc. No Chinese garlic though -- it was local & organic, finely chopped. Thanks for letting me know I don't have to toss this dish which has filled my house with a wonderful scent! This start happening about 10 years back. The garlic I mashed did not touch water or metal and still became blue in less than an hour. I looked on the packing label: "Made in China". This just happened to me- sliced some garlic, put it inside a trout with some preserved lemons, put the trout in the oven, and 45 minutes later out comes the trout with neon blue garlic slices inside! Considering the amount of garlic I've eaten in my life, I'm astonished it's taken me this long to experience this phenomena. Pleased to learn that I (probably) haven't poisoned myself by eating it. I was making barbecued pulled pork and had this happen. Almost threw it all out. Then read this. Still feeling uneasy about eating though. Shame I didn't read your article before chucking my food. I was in total shock after my garlic mixed with ginger and lemon juice turned this poisenous looking blue ! It really does not look edible. Well and for one, there might be unwanted pesticides in the garlic itself that react with the naturally occurring acids - as I recently found out that most of the chinese garlic is fertilized with human waste. That's one of the reasons why I only eat organic foods these days. Well written. I've had this happen when making a dipping sauce for lobster that consists of lemon, pressed garlic, white wine, butter, and pepper. The garlic often turns a nice turquoise colour when simmering (probably the acid in the lemon and wine). But I strain the mixture before serving, so the blue gems stay in the kitchen . . .
How fascinating, never heard of that. A well written piece that leave me wanting to play kitchen chemist! I use garlic a lot in recipes but have been fortunate enough never to get unusual colour garlic. However, I am now informed and if I ever experience funny coloured garlic I will think back to this hub and remember not to panic! My husband and I were cooking a garlic and rosemary chicken dish.. when i took the chicekn out of the oven, the garlic had a strange teal/aquamarine color.. freaked both out. I've never known garlic could have that reaction to acid. Oh man, I just experienced the blue garlic phenomenon! I was eating some leftover pasta today to which I had added some raw garlic a few days ago. Today the garlic is bluish-green, like cooked broccoli! Hmmm will this make my pickles blue? My garlic turned blue while making the brine. Just an anecdote re: blue garlic. When I was a peace corps volunteer living in a small eastern european village, I frequently cooked with garlic and it turned blue EVERY TIME. In the U.S., I've never had this happened.